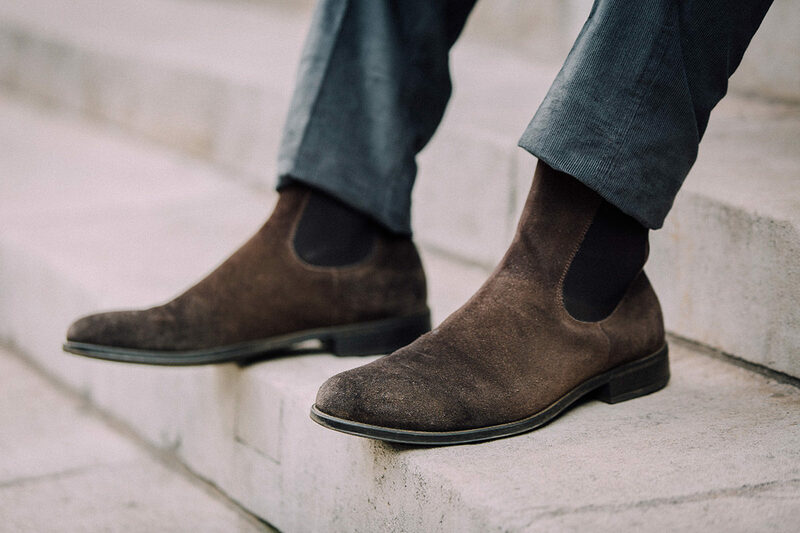 Doucal's brown suede Chelsea boots are a versatile option for casualwear but also come in handy when dressing down a suit or adding texture to a look. In shoemaking, as in life, there is a smart way to become accomplished and that is to learn from the best. Accelerated learning, whether from a tutor or otherwise, allows one to master a craft in double quick time, learning the ways and tricks of the master and in doing so, free up more time for experimentation, innovation and perfection. This is the path Mario Giannini, the founder and proprietor of Doucal's, chose in 1973, when intent on developing a luxury shoemaking business in the Marche region, he travelled to England and Northamptonshire, the Mecca of handmade shoemaking, and immersed himself in the ways of the masters. It was there that Mario enrolled for an internship with Handmade Goodyear, a prudent move that would catalyse his business and shape the rest of his life. If one is going to learn the tenets of classic shoemaking, Northamptonshire is the place to do it. Home of the likes of John Lobb, Joseph Cheaney, Edward Green, George Cleverley and Crockett & Jones, it is a cobblers row of world-class artisans and craftsmen. Mario's mentor, then, passed down to him all of the secrets of the various construction methods and the rules of English style that were so influential during those years in the European market. After several months of training, Mario returned to Italy and passed on his knowledge and skills gained in Northamptonshire to his modest artisanal enterprise that would, from that moment on, focus exclusively on the very British dedication to perfection. To honour this journey, Mario decided to anglicise his company's name Duca (meaning 'Duke' in Italian) to Doucal's. Mario's apprenticeship in England taught him a great deal about English shoe construction, which focused on a certain rigidity in style, not least afforded by the Goodyear welt construction which came about because of machinery invented by the American Charles Goodyear, which allowed the upper and insole to be stitched to a welt. But where the English style, much like the collective English upper lip, could often be stiff, it was Mario's intention to develop a more flexible and immediately comfortable shoe that would better suit his Italian clientele. He tasked his children, who had joined the family business, to research and develop ways in which that Italian ethos of sprezzatura could somehow be incorporated into the unerring construction techniques he learned in Northamptonshire. The results speak for themselves. Doucal’s shoes are now conceived to look like their English cousins whilst incorporating the comfort of an Italian shoe, aided by a sockliner in the insole with an activated carbon coating, which guarantees the foot great comfort and freshness, combined with anti-bacterial action, which given the more clement Italian climate is a huge advantage. Mixing unique design and boasting a diversity of lasts, each with a strong identity and peculiar details, Doucal’s has been able to merge Italian class with English heritage, all the while using the highest quality leather from both Italy and France. It has also taken every effort to make sure it is a sustainable enterprise, which for the leather and tanning industry is no mean feat. This season The Rake has curated a selection of Doucal's shoes that perfectly illustrates Mario's and his family's vision for what Doucal's stands for. From the graded tan suede Chelsea boots that put a twist on the classic black leather silhouette, to the sleek dark brown brogue boots, you'll instantly recognise the Doucal's touch. It's a subtle reworking of classic silhouettes, both honouring the shapes of the past while evolving them ever so slightly for a discerning contemporary audience.